The Fakeout, the Tease and the Breather, the sophomore full-length from Chicago-based orch-pop sextet Canasta, has been a long time coming. After receiving positive attention from the likes of the Chicago Sun-Times, All Music Guide and PopMatters for their 2005 debut LP, We Were Set Up, the band might have been inclined to rush out more music, but instead opted to take their time crafting a follow-up. The 11-song result proves the time was well spent, offering up a set of thoughtful, heartfelt pop that reveals more and more to love with each listen. The record's main focus throughout is melody, but it also incorporates an eclectic mix of sounds. Melancholy, introspective tracks such as "Throwaway," "I Don't Know Where I Was Going With This" and "Plan Your Escape" give the album definite emotional power. On other songs, the band takes a more playful, musically upbeat approach that creates some of the The Fakeout's finest moments. One of the biggest highlights is "Reading the Map Upside Down," an instantly charming track that dabbles in blue-eyed soul. The lively "Mexico City," "Magazine (Songwriter on a Train)" and "Choosing Sides" (which finds lead vocalist Matt Priest sharing duties with bandmate Elizabeth Lindau) are also strong points that provide a great balance to the more subdued material. As is the case with most great records, The Fakeout requires a bit of dedication on the listener's part. The melodies are consistently pleasing, but with more than half of the tracks clocking in at over five minutes and a penchant for subtlety on much of the material, the LP needs a few plays for everything to really sink in. 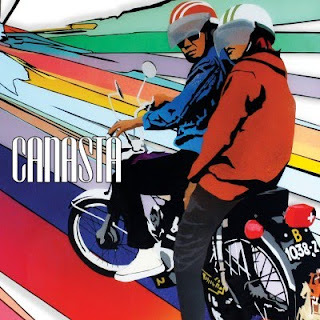 What's noticeable right away, though, are Canasta's superb musicianship, mastery of melody and achingly earnest vocals and lyrics delivered by Priest. On album opener "Becoming You," for example, he sings, "I don't care much for football scores, the great outdoors, guys being guys/I don't dream of fast cars or fat cigars or other things I'm supposed to prize...but I am faithful to the ones I love and that's enough/I will not fail." We Were Set Up established Canasta as one of Chicago's most notable indie pop acts, and The Fakeout should bring them many more accolades and opportunities. It may have taken a while to come to light, but it was well worth the wait. Canasta are offering free downloads of two other tracks from The Fakeout as well as a stream of the entire record at canastamusic.com. The CD will be available at the band's two-show record release celebration at Schubas on Saturday, May 8, and everywhere else on May 18. You can pre-order it here.